This little story is about my recent glass block window installation project. I have a confession to make: I write better than I work, and I am a terrible procrastinator. So the dark dungeon that is our laundry room has remained in that condition for sixteen years. That is, until this fall, when I was shamed into installing glass block windows. She can be a very effective communicator. 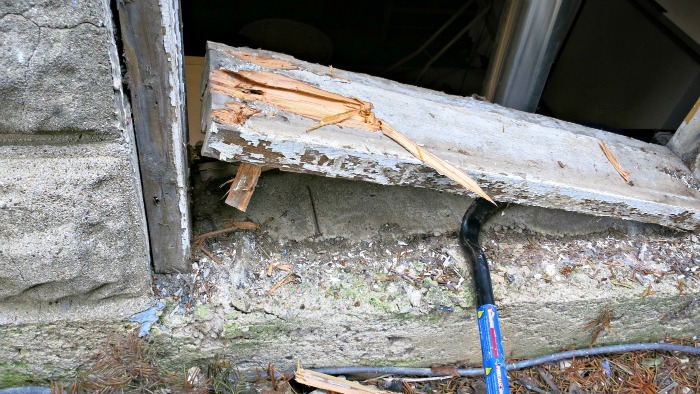 She had the idea that I would simply remove the fiberglass installation that a previous owner had crammed between the single pane windows and a protective layer of vinyl. Our laundry room is in the basement, and these are ground level windows that have the lovely view of the bottom of some bushes. The insulation kept the house warmer, and there wasn’t much to look at, so his “improvement” made some sense. Unless you were folding laundry, in which case some daylight would make the job much more cheerful. 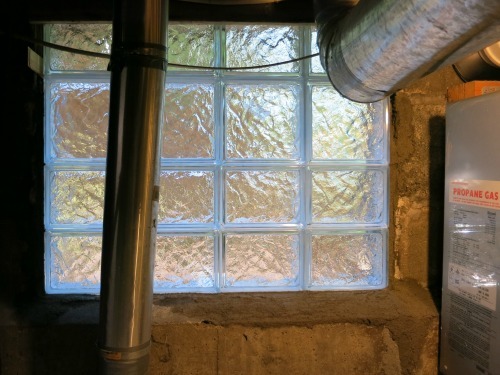 The glass block was my way of bringing in light and keeping the basement warm. It also has the benefit of not showing the dirt that inevitably splashes up on ground-level windows. I’ve always like the idea of glass block windows, but they don’t fit with every home. 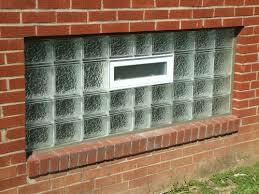 Period homes look a little odd with glass block installed, unless the style is Modern or Art Deco. But they have a place, and basement windows shrouded by bushes is definitely one of them. This was a new field for me. I have never attempted a glass block window installation before. What I envisioned was laying the block like I was building a wall. That is how many windows are installed, one row at a time. 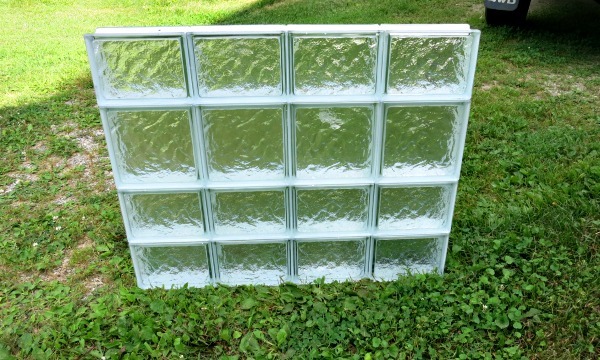 However, while researching the topic I discovered that glass block window distributors often will bundle the blocks into a ready-to-install window. This is the route I ended up taking. When you install glass blocks like you are laying bricks you need to keep the blocks aligned and evenly spaced. Since light comes streaming through the window any irregularities will stand out. The distributor builds up a window in a controlled environment with fixtures to keep the window squared and the blocks aligned. My feeling was that this was going to result in a window that was much more neat and trim than I would have made. Also, the cost difference over simply buying the materials was surprisingly low. I provided the distributor with the dimensions of my opening. The framing that was in place had to be removed, so I measured the opening in the concrete. The window that he was able to quote was an almost perfect fit side-to-side, but had a gap of a couple of inches vertically. Block comes in standard sizes, and they make half blocks, but you are stuck with windows in increments of the block dimensions. It took him a few days to make my windows. When I went to pick them up I discovered that these windows had to either be laid on a flat surface or on their end. Fitting them into the car was a little bit tricky. However, the caulk they use to bind these together is strong and resilient. I was able to get the window home in one piece and ready for my glass block window installation. 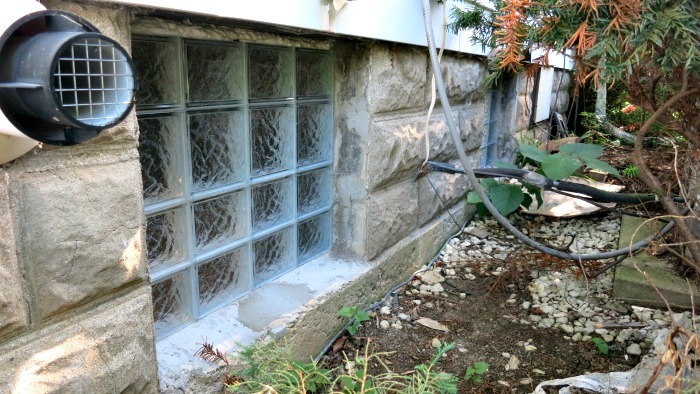 The hardest part of the whole glass block window installation project was removing the old windows. These were hopper windows and removing the glass only required turning a few screws. Getting the window frames out proved more difficult. A large wrecking bar, a hammer and a saw finally did the trick. After prepping the openings I brought the first window over. I feared that when I inserted the window it would topple out the other side, so I hammered a board across the inside opening, so I could make sure that the window was installed flush to the inside wall. I was glad that I did not have a larger window. It was a one-man job, but a larger window would have required two men. At some point pre-made windows become too large and you need to lay the block by rows. Before insertion I had to lay a base layer of mortar down. I used shims to control how high the window stood off the base. I didn’t want the glass block touching the concrete wall directly. You want mortar between the glass and a hard surface so that you can ensure the load is evenly distributed. After the window was inserted the next step was to fill in the sides with mortar. A trowel can help getting the mortar in place, but your best tool is a mortar bag. This allows you to squeeze the mortar into the opening. Whatever technique you use you are likely to have quite a mess on your hand. There isn’t a good way to get just the right amount in place. It will want to squeeze out on either side of the window. Just plan on this, lay drop cloths, and have a wet rag handy for the clean up. An inside view of the glass block window over the washing machine. I ended up using caulk on the top seam. The support beam for the house formed the top surface and I thought that caulk would bond better with the wood, avoiding fissures . Since I had a couple of inches I filled the interior with an expanding foam, and saved the caulk for the surface. I was advised to have a vent installed in the glass block window. 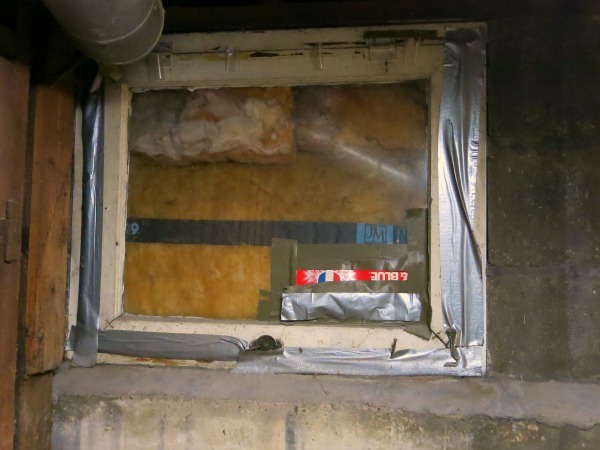 Having some way to get airflow into a basement is a good idea, but I opted not to have it included in the window. I have yet to see a vent built into a window that looks good. With my basement I had other windows and a door that could be opened so it was not needed. If I change my mind later on I will simply install one in the wall, where it won’t be as distracting as having a vent in the middle of your window. Remember, this wall already has vent pipes and air conditioning pipes running into it. In other situations it may not make as much sense to vent through the wall. The end result made both me and my wife very happy. Laundry is still a chore, but it is done in a much friendlier environment. Now perhaps I'll tackle the windows on the other side of the house. I do feel I cheated just a little, with the pre-assembled glass block window. Maybe next time I'll lay them like block, as in this video on installing glass block. A view of the two windows I installed.